I went out and harvested some of our rhubarb. We have three plants and they have all done fairly well this year. 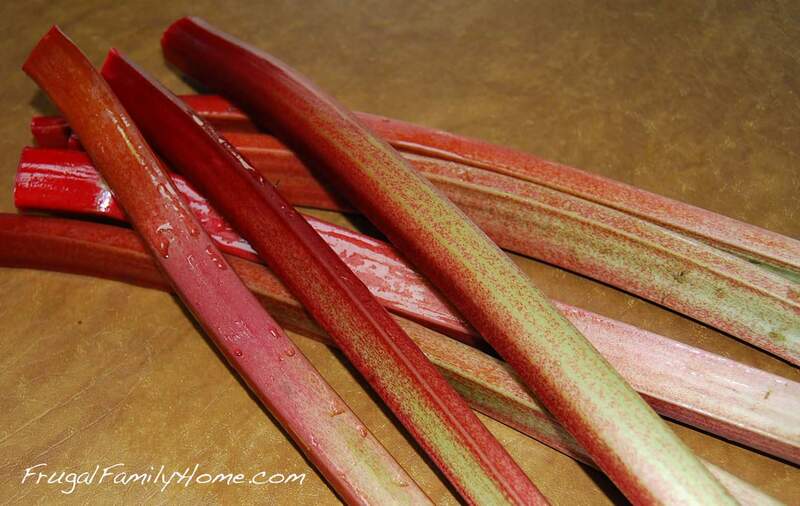 If you are looking for a fairly easy plant to grow, rhubarb is a really good one. If you have a fairly sunny area this plant will usually grow without too much work from the gardener. Usually by this time of year we are harvesting spinach, lettuce and sugar snap peas along with the rhubarb. But this year with all the rain we have had our garden got a late start. We have some green strawberries on our plants and our raspberries have flowers on them so hopefully soon we will have some berries to harvest. I can’t wait to have some homegrown strawberries they are always better than the ones from the store. Do you grow any of your own food at home? I would love to hear what you grow and how your garden is doing this year. I’m so glad your garden is growing well 🙂 I tried growing tomatoes last year and they didn’t do so well, so I gave up. What do you make with your rhubarb? You can make rhubarb jam or quick bread like banana bread or I have a few cake recipes that my grandma and aunt used to make often.